So if the Son sets you free, you really will be free….. The dream of freedom can enable men and women to overcome incredible obstacles and hardship to obtain it. Where freedom is present nations and lives flourish. We are blessed in United States with opportunity and resources that are unimaginable in countries where individual freedom is non-existent. In these places poverty, hopelessness, and a lack of even basic necessities for life are prevalent. But the most important freedom that is denied in many of these places is the freedom of religion. The freedom to pursue and know God without restriction. But even here in the home of the free with all that we have been blessed with true freedom is an experience many have never had. When we live life outside God’s plan for us we can experience all the freedom we are entitled to by our laws and government, and never truly be free. God has a very different view of freedom. He offers freedom from this pattern. Paul underscored it when he wrote to the Romans: “But now that you’ve found you don’t have to listen to sin tell you what to do, and have discovered the delight of listening to God telling you, what a surprise! A whole, healed, put-together life right now, with more and more of life on the way! Work hard for sin your whole life and your pension is death. But God’s gift is real life, eternal life, delivered by Jesus, our Master” (Romans 6:23). Sin is the reason we do not experience true freedom. And sin can be defined in many ways. Sin is opposition to Gods laws most of which are the foundation principals of law that our courts, government and law enforcement adhere to. But more than a breaking of the “law” sin is missing the mark. Operating outside the plan and rebelling against the direction God has for our lives. There are always two opposing forces in operation. One that encourages us to live our lives however we please, and one that encourages us to live in a way that pleases God’s. Many times living a life that pleases God will run counter to the worlds way of living. In the long run following God’s voice, expressed through the Bible will lead to the life Jesus said would be “more and better than you could imagine” (John 10:10). Here and now and later. Following the other voice? Well take a look around you at all the suffering, hardship, death, and destruction that exists for many in the world, even here in the U.S. where so much opportunity is available. True freedom only comes from the Son who indeed can set us free.. 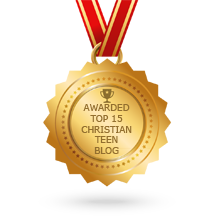 This entry was posted in A CLICK A BLESSING TODAY, Christian Teens Blog JF, CHRISTIAN TEENS BLOGS, Christian Teens Blogs - He is my Peace, Christian Teens Blogs - He is my Peace, Light and Refuge, SHARING STRUGGLES, TAPESTRY TREASURES and tagged Freedom in Christ. Bookmark the permalink.